If a Word document is created with a barcode font and the end user does not have the font installed on their computer, the resulting barcode document only displays the encoded data instead of the intended barcode font. This issue can usually be solved by embedding the TrueType Fonts into the document. 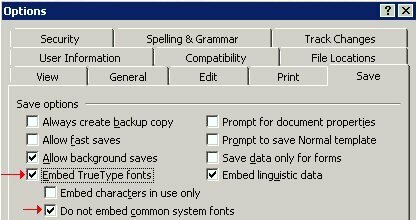 After a document has been created with the barcode fonts, it is then ready to embed those fonts by saving the document using the instructions for Word 2007 and greater or Word 2000 and Word 2003. Choose the Office button on the upper left corner and click on Word Options. 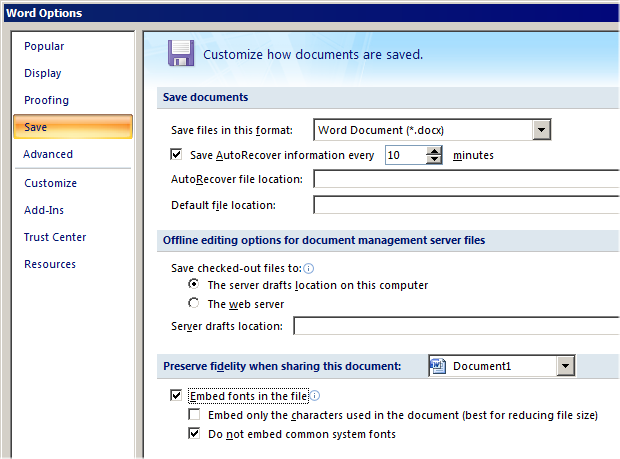 Choose the Save option and check the box to embed fonts in the file. Do not choose the option to embed only characters used as this can cause problems with barcode fonts. NOTE: Embedded fonts require a Developer License for the font. Check the box that says Embed true type fonts. Make sure the box for Embed characters in use only does NOT have a check. Anyone who opens this file should be able to see the barcode embedded in the document.